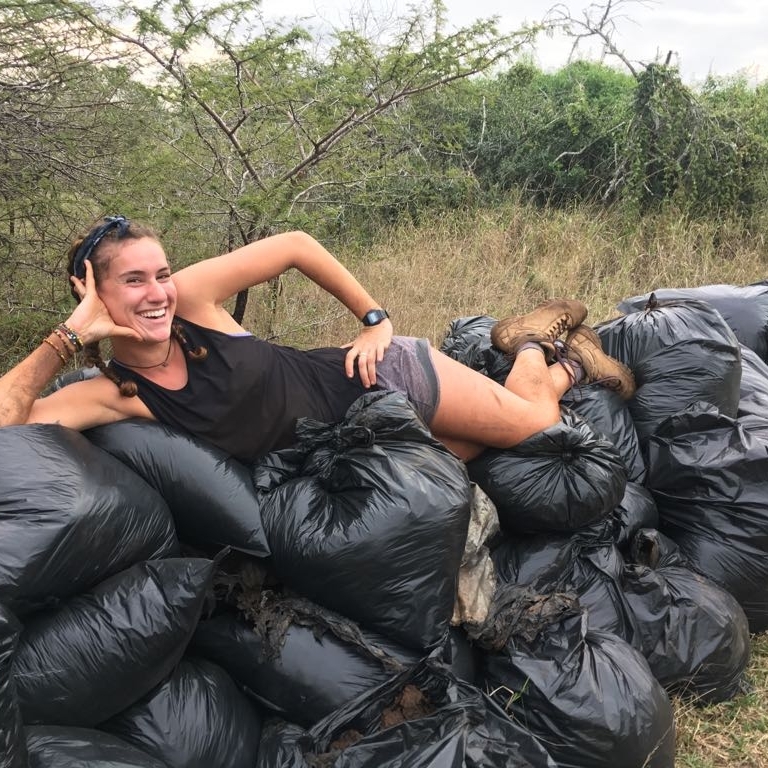 In August 2018, a kind-hearted group of volunteers from New York swapped the concrete jungle for South Africa’s Zululand, rolling up their sleeves to experience conservation behind-the-scenes with Wild Tomorrow Fund. 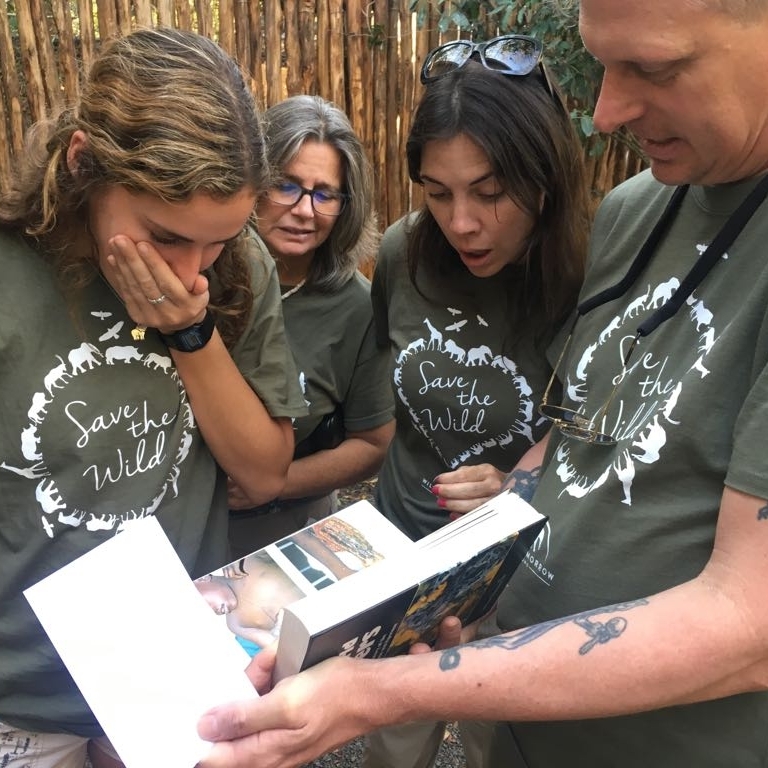 Before leaving home, each volunteer raised funds as a direct donation to Wild Tomorrow Fund’s wildlife and habitat protection programs, contributing over $10,000 as a group. While in the field, the volunteers were involved in a wide range of conservation-focused educational and hands-on activities including working on Wild Tomorrow Fund’s Ukuwela Conservancy, repairing a government ranger camp, delivering donations and cooking lunch for local school children and orphans, and participating in a rhino dehorning, plus some well-deserved safari drives! Read more about the fun and impactful trip and please consider joining us in 2019. The volunteers enjoy a sun-filled day on the banks of the Mzinine River, the northern border of Wild Tomorrow Fund’s Ukuwela Conservancy. Most safari trips are spent sitting on a game drive vehicle, with little action other than watching wildlife. 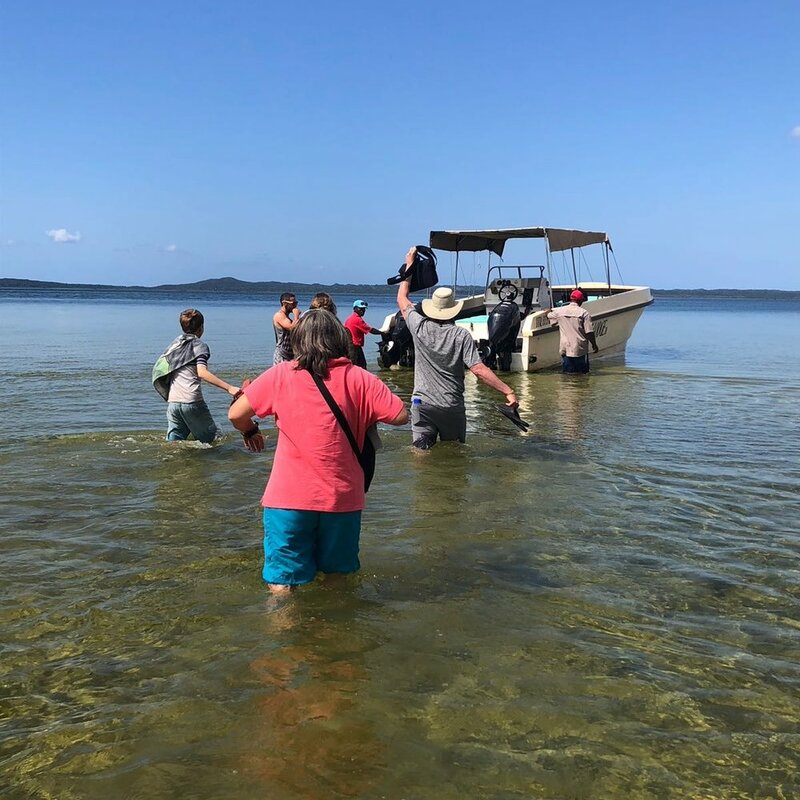 That’s what makes our trip different, as volunteers are able to literally get active and a little bit dirty, working hands-on to help conservation while also experiencing the incredible wildlife of the region. 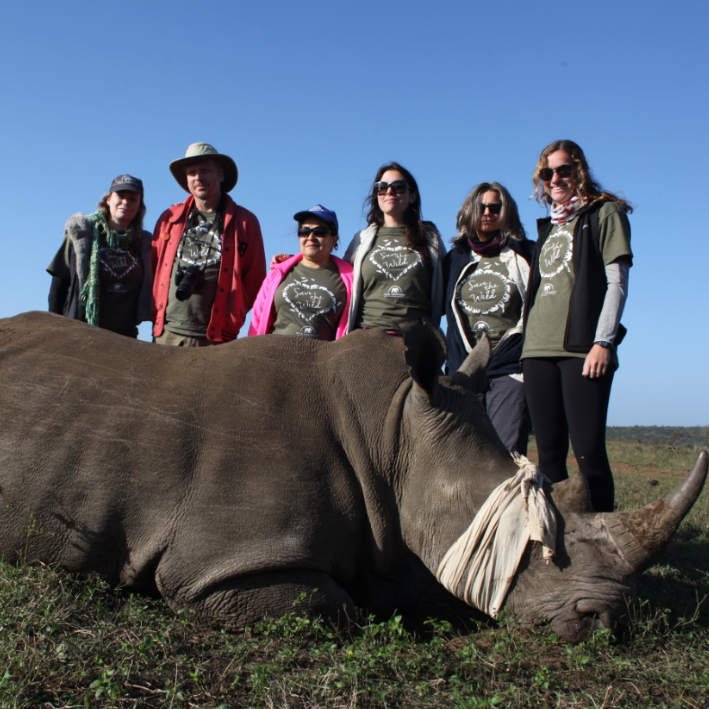 This year, a highlight of our volunteer trip was the opportunity to help dehorn two rhinos at Phinda Private Game Reserve, paid for using funds raised by the volunteers. With rhino horn currently worth more than gold or cocaine by weight on the black market, rhinos are literally walking around with a target on their heads for poachers. Dehorning decreases the incentive for poachers to kill rhinos. It’s a drastic measure for reserves to take, but a highly effective one to conserve the species (read more about rhino dehorning from our ecologist, Axel, here). Dehorning doesn’t hurt the rhinos as it’s made of keratin, the same material as our fingernails. And in regards to dehorned rhinos being able to defend themselves from other rhinos or carnivores, there have been no recorded changes in survival probability. The volunteers were filled with many emotions during this incredible conservation activity. It was a day they will never forget. Volunteers also spent several mornings and afternoons rehabilitating habitat at Wild Tomorrow Fund’s Ukuwela Conservancy. Their first job was helping remove plastic that had been illegally discarded by a pineapple farmer. Volunteers donned their work gloves and set about filling over 100 bags with the illegally dumped plastic, removed after years under the soil of the river bank. As the sun set for the afternoon, we calculated that the hardy volunteer team had removed over half a ton of plastic. This is important work, as this plastic is at risk of polluting the nearby iSimangaliso Wetland, a RAMSAR designated wetland of international importance. We toasted our success over a gin and tonic sunset by the river bank to end our day. Good job team! Since taking ownership in mid 2017, Wild Tomorrow Fund has been working hard to rehabilitate and restore the Ukuwela Conservancy. An exciting step is the re-introduction of wildlife. Additional giraffe, zebra, wildebeest, impala and waterbuck have been released at Ukuwela over the past year, joining many other species that already called it home including leopard, hyena, the elephant shrew (tengi), suni antelope and more species yet to be discovered. It will be some time before Ukuwela becomes extended habitat for lions, elephants, rhinos and buffalo (dangerous species for humans to encounter). This means our guests are able to explore Ukuwela on foot. Volunteers spent time walking through the grasslands, by the river, seeking out our resident giraffe,zebra and wildebeest as photography subjects, and getting up early for a morning patrol with our rangers. Volunteers were tasked on two occasions with channeling their ‘inner elephant’, by helping to clear an area filled with the native invasive (and very thorny) sickle bush. This tree is particularly a problem in areas where there has been overgrazing. Where it invades, the sickle bush forms very dense thickets making areas impenetrable. Elephants naturally knock down trees like sickle bush in dense areas, which in turn allows grasses to grow, an important food source for browsing herbivores including zebra, wildebeest and antelope. Volunteers sawed and hacked at the sickle bush, clearing space and creating open area ready for new grass. At the end of the day everyone felt a little sore, their hard work evidenced by thorn cuts, but it was well worth it, and a first for most of us who don’t usually cut down trees! View from the bank of the Mzinine River, the northern border of our conservancy Ukuwela. Government reserves in South Africa operate on shoestring budgets, which means that accomodation for rangers, who put their lives on the line to protect wildlife, is not a high priority, and camps are in need of repair. The volunteers set out to Hluhluwe-Imfolozi Park (HIP), a government-run reserve that is home to the Southern White Rhino, and is under intense rhino poaching pressure. 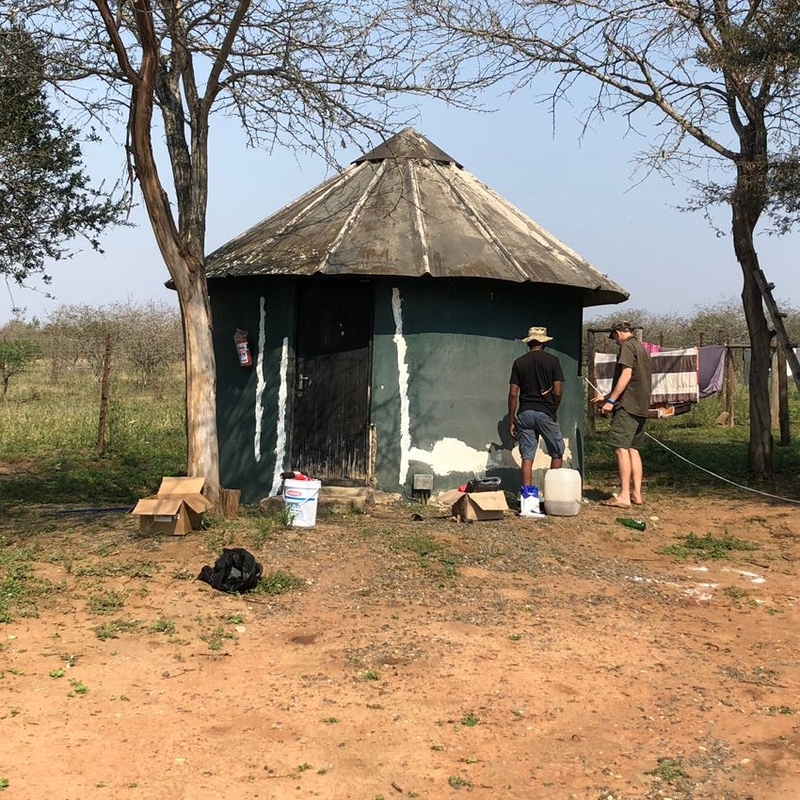 Volunteers worked side-by-side with Ezemvelo KZN Wildlife rangers to sand and paint the walls of their traditional rondaval huts. Wild Tomorrow Fund also supplied new doors and other much needed items and equipment to help restore ranger camp. Head rangers and section rangers joined the volunteers each night for drinks, food and conversation. For the volunteers, this opportunity to work, and also spend time over dinner and drinks with rangers, was a personal way to connect and understand more about their lives and the daily risks they take to save rhinos and other wildlife within their reserves. An important part of the trip is getting out and about to visit the amazing sights and wildlife that the region has to offer. 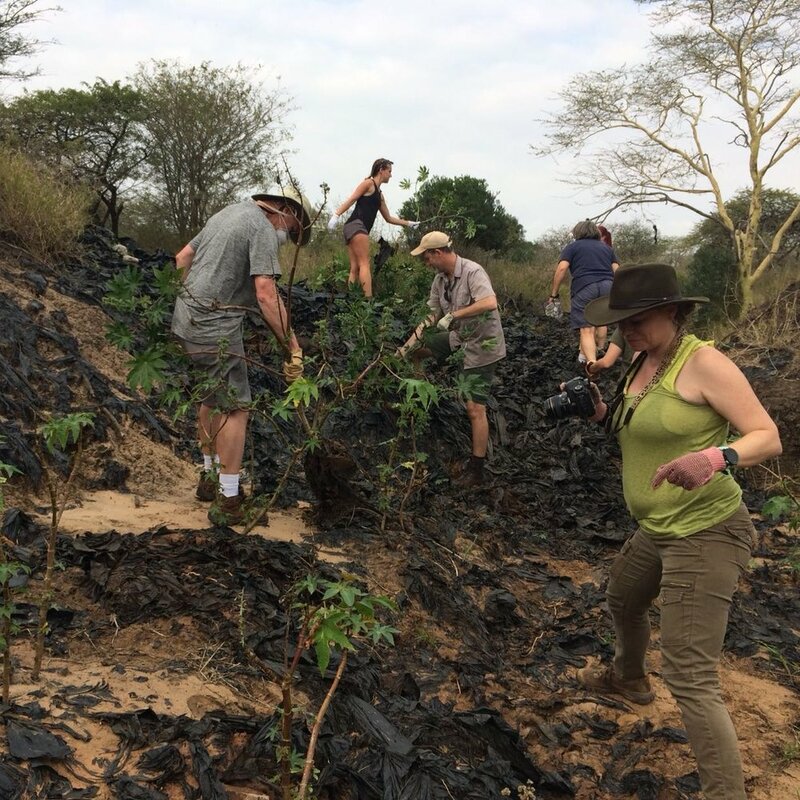 Volunteers visited St. Lucia, an area on the southern tip of the UNESCO World Heritage iSimangaliso Wetland Park. One morning was spent on a hippo and crocodile boat tour, learning about conservation challenges facing South Africa’s most important wetland system while spotting several of the parks’ over 500 species of birds. After a local lunch, the volunteers saddled up for a horseback safari. Gibson, Geronimo, Tabasco, and Lesotho were some of the trusty horses they rode through the iSimangaliso Wetland Park alongside zebra, wildebeest and impala. Our volunteer Paula getting her dream wish, kissing an elephant! Volunteers also visited the Bayate Reserve where they were able to meet and get very close to three semi-wild elephants and hear their stories. Rambo and his brother had escaped from a culling operation when they were very young. Instead of culling them, those involved decided to raise them by hand until they were old enough to be released. 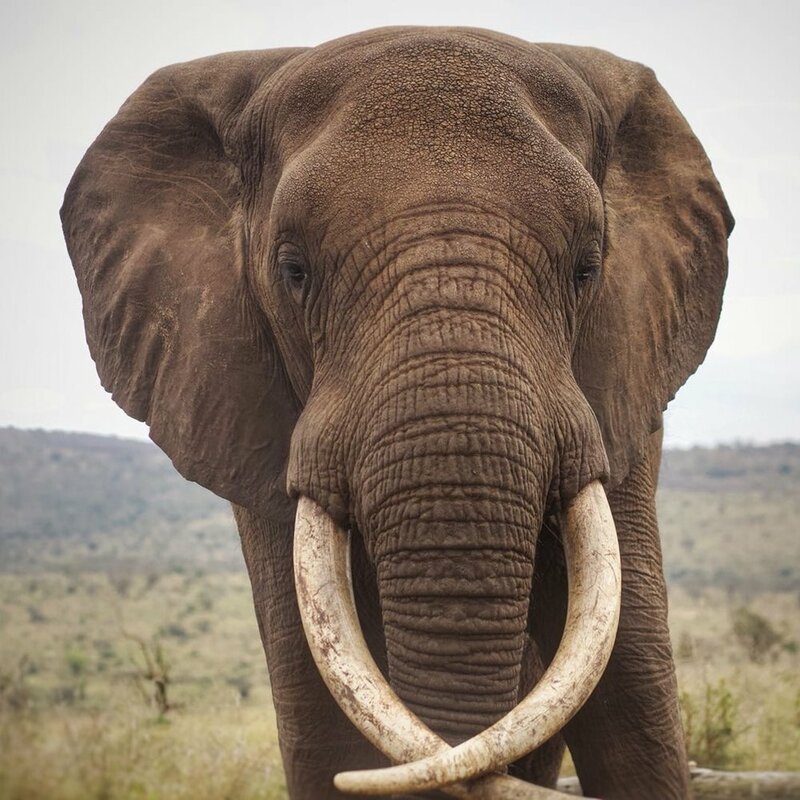 The elephants became quite habituated to humans and when reintroduced to the wild, continuously misbehaved breaking out of reserves and taking human food. After numerous attempts to change their ways, Zulu Nyate took them in. Now they live a semi-wild life roaming free, except when they voluntarily come to greet guests (and receive food). The volunteers had the chance to feed Rambo, touch his tongue, and feel the muscles on his legs and stomach. Wildlife interactions are a controversial topic, but Wild Tomorrow Fund deems this one humane and ethical! Towards the end of the trip, the volunteers’ hard work was rewarded with a trip to the beach. Located just a couple miles from the border of Mozambique, the Kosi Bay estuary is home to one of the most beautiful beaches in South Africa. The volunteers spent a day exploring the Kosi Lake System by boat. 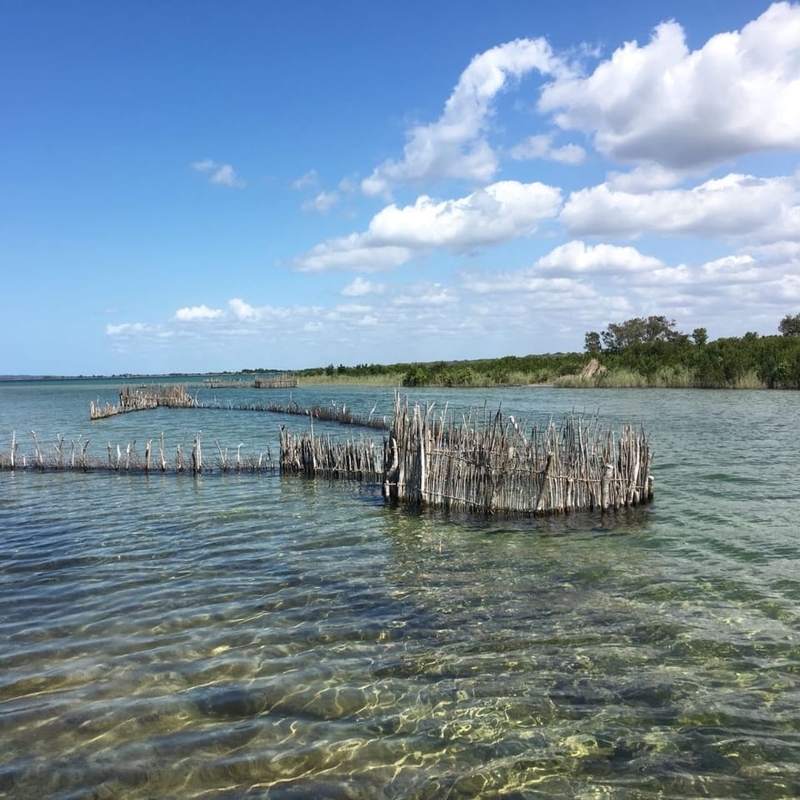 They learned about traditional Thonga fish traps, and hiked to a beach where they had a picnic, swam in the Indian Ocean and watched humpback whales breach in the distance. On the way back to Hluhluwe, the volunteers were also treated to a game drive at Tembe Elephant Park. Bush walks with Wild Tomorrow Fund’s Axel, Clinton and Barbara on Ukuwela were great opportunities for the volunteers to learn about the flora and fauna found on our very special conservancy while immersed in nature. Barbara also gave volunteers a tour of her resident scorpion and spiders that are part of her studies. Local snake specialist, Anton Roberts gave the volunteers a reptile talk. Volunteers were able to get up close and personal with flat rock scorpions and tailless whip scorpions. Things got a little riskier when Anton brought out a puff adder and forest cobra (the volunteers remained a safe distance away from these dangerous snakes at all times). Drives through the Ukuwela conservancy regularly consisted of running into the newly-released giraffe, zebra, wildebeest and impala. Whenever the volunteers came upon the giraffe they photographed them for an Identification Kit. They were able to ID Katherine, Muki, Zina, Burl, and JJ (the names given to the giraffe by donors who paid for their reintroduction). The volunteers visited the Silethukukhanya Creche (preschool), which Wild Tomorrow Fund supports. They delivered the creche’s monthly food donations, as well as an extremely generous donation of knitted hats and scarves from the Mending Hearts Mission of the Fordham Manor Church, Bronx, New York. These warm clothes were the perfect gift as it was currently wintertime in South Africa. The kids, and their mothers who made a special trip to meet everyone, were overjoyed. A highlight for the volunteers was helping to cook a meal for 45 orphaned children. Most of the children had lost their parents to diseases such as HIV. The local church feeds them all week, apart from Saturdays. That’s when the volunteer soup kitchen steps in. The volunteers were more than ready to don aprons to chop, mix, sautée and cook the kids a healthy and hearty meal of rice, chicken, onions, cabbage and baked butternut squash. Last year, a very generous Wild Tomorrow donor paid for a year’s worth of Saturday meals. Read more about Wild Tomorrow Fund’s community efforts here. Can you say "A frog crossed the road" in Zulu? Here it is in the Zulu language, taught to us by a ranger at Hluhluwe-Imfolozi wildlife reserve. The volunteers tried local beers, ciders, wine and spirits as well as local delicacies such as a braai, potjie, pap/samp, biltong, pavlova, vetkoeks and game meats. The group made it their mission to have a “Zulu Word of the Day”, learning the translation for African wildlife they came across. Car rides were spent rehearsing. “Elephant?” someone would ask. “Indlovu” another would answer enthusiastically! One evening spent with rangers, they attempted to learn “A frog crossed the road” in Zulu. Have a laugh and watch the video below. Two special nights were spent camping under the stars, sharing stories around a campfire (braai) and falling asleep to the distant sound hyenas. 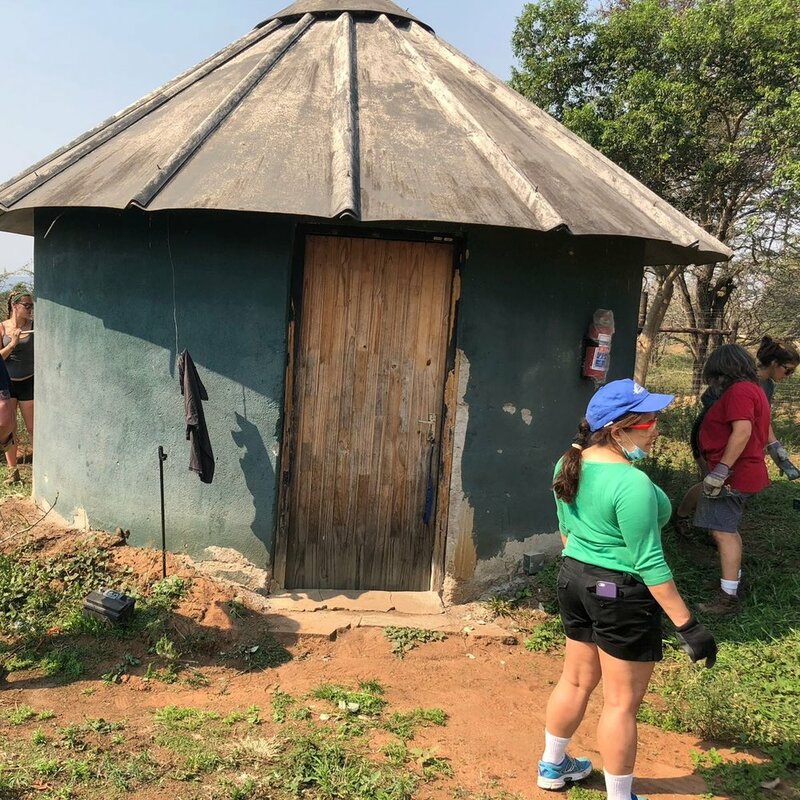 The morning prior to the dreaded flight back home, the volunteers ended their amazing two weeks with a 6-hour half day safari drive through Hluhluwe-Imfolozi Park. They were treated to some incredible sightings that included a herd of elephants crossing in front of the vehicle (and even some mock charges), the adorable site of baby elephants walking with their protective herds, a baby rhino suckling on its mother, a lionesses with young cubs, and at least 100 white-backed vultures feeding near a waterbuck carcass. 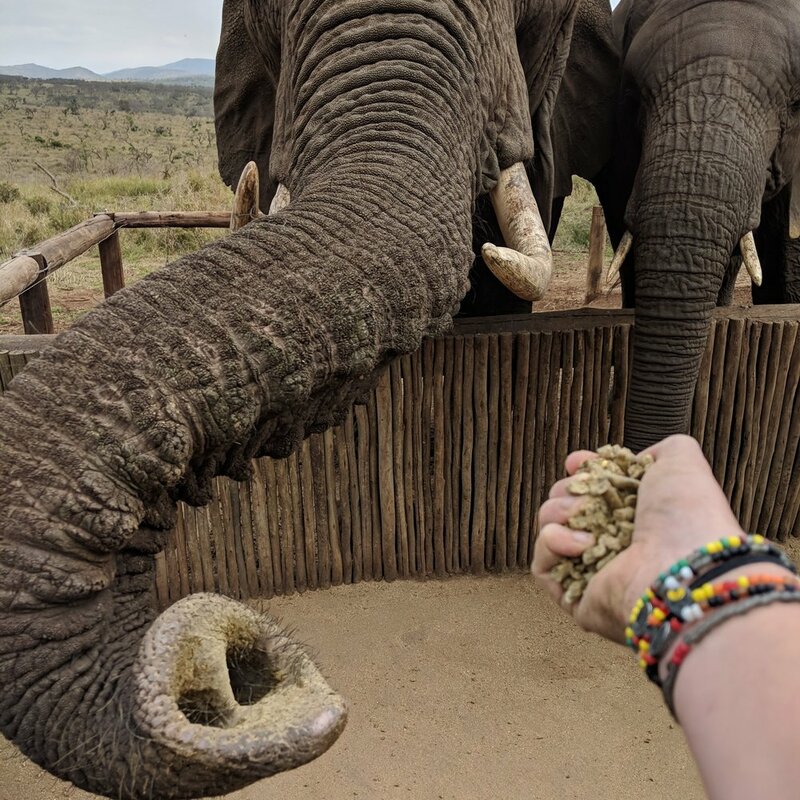 For Monica, who had always wanted to volunteer, and chose Wild Tomorrow Fund’s trip as her first volunteer experience, the elephant charge was one of her most memorable moments. You can relive this slightly nerve-wracking moment as our vehicle reversed to give these beautiful animals all the space they needed. A wonderful sight as an elephant charges our volunteers at Hluhuluwe-Imfolozi Reserve, in South Africa. Video by Monica Morales. If this sounds like a trip that you’d find enjoyable and rewarding, then find out more on our volunteer website. Please contact us to reserve your spot, or send us any questions. We look forward to hearing from you and hope you can join us on the conservation experience of a lifetime in Zululand South Africa!